Holy Trinity St. Barnabas Church will play host to a renowned London choir. On the 3rd November, The Addison Singers from Kensington, under the direction of David Wordsworth, will perform a variety of traditional and modern pieces. It has been said that ‘the music the Addison Singers perform, other choirs perform twelve months later’ due to their programme of innovative contemporary pieces. They have been winners eight times of the prestigious PRS Music prize for new music, having had several celebrated composers write pieces for them. One such composer, Bob Chilcott, is president of the choir and they were fortunate to perform under his baton in a memorable concert at Carnegie Hall in New York. 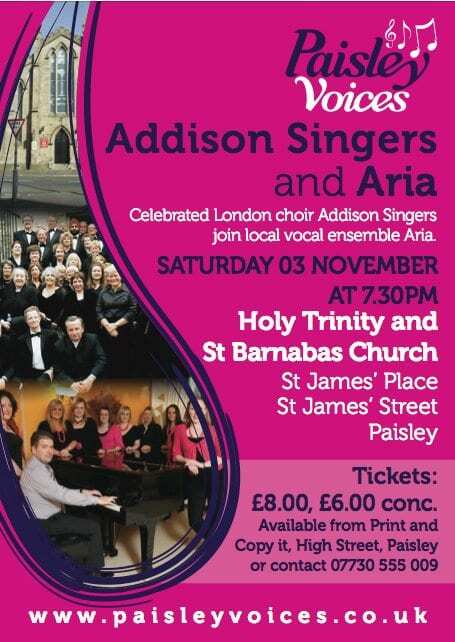 Sharing the platform for the evening will be Aria, a local female vocal ensemble, directed by Paisley Voices Chairman, Jim Drennan. Having been guests of the Addison Singers in London two years ago, Aria are extremely excited to be working with such a fantastic group of singers once again. Aria’s fresh varied programme has won them many accolades and prizes including the Orpheus Trophy at the Glasgow Music Festival and as Regional winners in the BBC Choir of the Year competition.